Ramona's Voices: "Onward, Christian Soldiers". Not just a hymn anymore. No, these new "Christians" see the quest for their version of morality as the war to end all wars. My idea of morality may differ from theirs, but theirs is Right and mine is wrong. If it were only a difference of interpretation, that would be one thing, but because I don't go along with their version of Playing Well Together (Or Else) I am now the enemy. I admit I've never thought of myself as the enemy of a Christian. This is new for me. Some of my best friends are Christians and I love them madly. For that reason, I've underplayed my anger at those who operate as haters under the guise of Christian love. The people who proudly call themselves "the Christian Right" may say they're Christians but I've known Christians and they're no Christians. They are the worst kind of hypocrites. The bible is a book of stories, some inspiring, some fascinating, some downright ugly. The Christian Right uses the ugly parts as proof that God wants them to discriminate. They argue that women have no rights, that minorities are inferior, that different kinds of love are sins worse than murder, and that liberal education is the work of the devil. They claim religious persecution while they themselves revel in their roles as righteous persecutors. They've scared our political leaders into kowtowing to their sick and sorry excuses for societal morality to the point now that bills must pass the Christian test before they can move on. Their greatest triumph is that no matter what they offer up, if they offer it up as an edict from God, thy will be done. Their proudest achievement is the almost total allegiance of the entire American political body to an idea that in order to govern one must be religious--preferably to the Right, but any claim to religion will do. They will tell you with great confidence that atheists will never win a public office. They have finally eradicated secularism from government. In their minds, it's a done deal. I would hate to think they're right. All righty, then. Break time is over. Back to work. The four most dangerous words to Humanity ever spoken. I was also surprised by the 'Christian flag'. I cannot figure out what a bible-reading Cristian is supposed to do with it, hang it in their closet, maybe? It's an arrogant thing to say but they never see it that way. These so called Christians don't believe in closets. Especially the ones people come out of. Hypocrites. 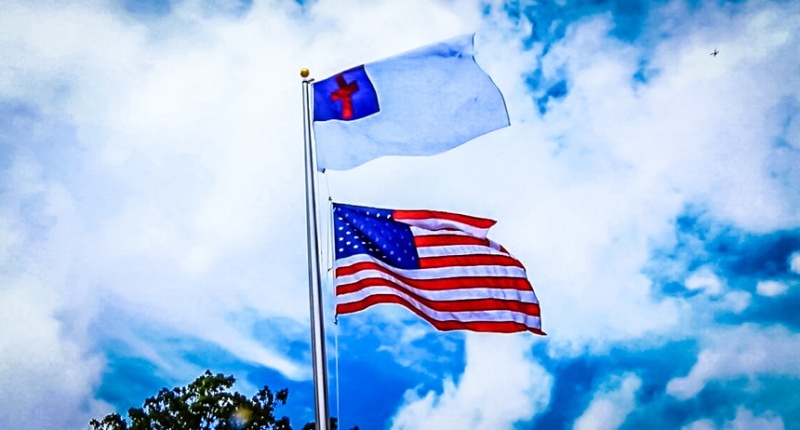 No self-respecting Christian would even think of flying a flag above the American flag. That's pretty shameful. These so-called Christians I would have to classify as bible thumpers, not bible readers. I just read where the New Testament rolls on to say it replaces the old, but the old testament is so much more satisfying to a thumper - all that smiting and stoning and judging gives them satisfaction, I think. But the new one definitely says go pray in your closet, it's between you and god. So how can you fit a flag into that? I think "righteous" is the most disgusting and most terrifying word in the English language. I like your thoughts that much difference between rights and deals.